Original and Splendid Straight Bourbon Blend. Four Roses Distillery is a special place with a special page in history. One of only six distilleries that were permitted to operate during Prohibition to produce medicinal Bourbon, it has an intriguing history. Sitting on the banks of the Salt River in the serene rural part of Kentucky, it saw ups and downs, until it was resurrected in 2002. Today, the Lawrenceburg distillery creates top-notch Bourbons, each with its special twist. One of the Four Roses' blockbusters is the Original Bourbon, formerly known as the Yellow Label, a fantastic NAS straight Bourbon. It's aged for around five years in oak barrels and supervised by Master Distiller Brent Elliott. The light amber Spirit is extraordinarily smooth and perfect for classic Bourbon cocktails (you can't go wrong with Vanilla Old-Fashioned or Bufala Negra). Like all Four Roses blends, it comes from the pool of 10 unique recipes. This bottle brings lavish aromas and flavors with a long and soft finish. Twelve awards cannot be mistaken. What does Four Roses Yellow Label Original Bourbon taste like? The Flavor Spiral™ shows the most common flavors that you'll taste in Four Roses Yellow Label Original Bourbon and gives you a chance to have a taste of it before actually tasting it. Fruity and floral scents with hints of gentle spice and honey. Crisp, soft and smooth on the palate with touches of fresh fruit, apple and pear. Soft, long and pleasant finish. Great flavor with a good finish. Sweet taste. Would buy this again! Reminded me of cilantro, might have been the fruity pear flavor, it did not sit well with my taste buds. I've had worse. And far better. Closer to $30 here. Nice bottle though. If I want a cheap go to, old faithful Jim Beam is the mixer. Good bourbon for the price. Awesome for mixing, less so for sipping. You can't beat it for the price. I usually keep a bottle of this around as my go to "cheap" bourbon. I can usually pick this up locally for about $20. The small batch and single barrel versions are great if you want more complex and full flavors, but it's hard to justify the prices when this is so damn good. Not bad at all. Good on the rocks and good with coke. A good daily go to. One of the best for the price! Definitely recommend, especially for new whisk(e)y drinkers. It’s alright for a daily old fashion, great for the price. I keep the yellow label around as a very inoffensive foray into bourbon for friends interested to try. If you want something very difficult, and entirely simple, this is your dram. Best left at the bar, lower shelf. Not a fan. Rough, with little hint of what makes bourbon great - the caramel and honey. Very mellow but smooth. No alcohol burn you get with most whiskeys of this price range. 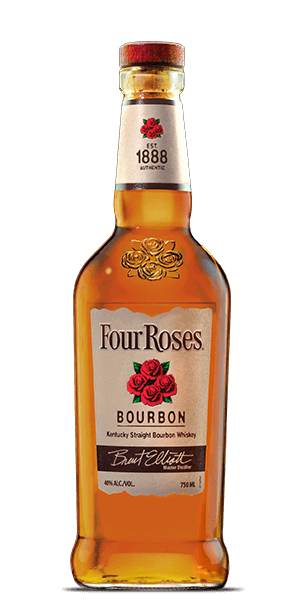 I like the four roses single barrel but it’s not great. I feel like people used it as their off the map favorite to sound smart, and now it’s just another basic overpriced bourbon. Nothing special. I love this bourbon. Intense, but smooth and easy drinking. Great everyday whiskey for the money. It’s good. Not as interesting as I would want it. Yellow label is my go to for a hot toddy. Zu Chemisch in der Nase. Auf der Zunge nichtssagend, wohl am besten zum Mixen.